I’ve always been a fan of buying clothes in supermarkets, usually when I realise I need something urgently but all the other shops are closed and supermarkets are the only places still open. I’ve never really found much to tempt me in Sainsburys however. In the past there’s never really been anything that suits my style and I’ve only ever found bits for the girls. That all changed when I popped in a couple of weeks ago and within 5 minutes had added about 20 things to my mental wishlist. You see, Sainsburys have gone vintage! 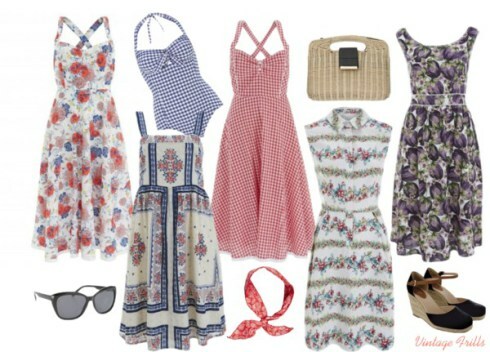 The vast majority of their Spring / Summer collection is inspired by the 1950s and I love it! Now if I was rolling in money at the moment I would have left with everything – at least 5 dresses, 3 cute blouses and a selection of lovely skirts and capri pants. However as I’m on a budget I left with two dresses. I thought I’d show you them and let you know what I thought after wearing each of them for a day. First up is my favourite. 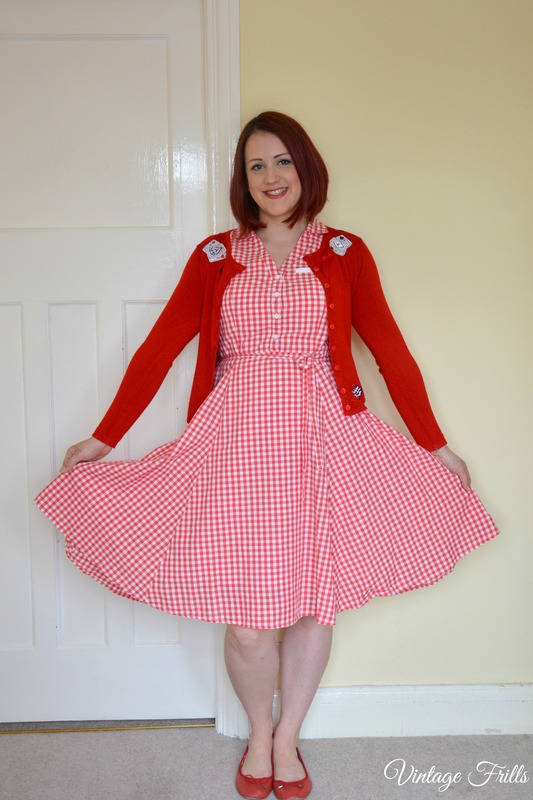 I have a bit of a thing for gingham, especially red gingham. Despite already having an original vintage Horrockses dress which is quite similar I knew this would be a great summer purchase that I would get a lot of wear out of without worrying about trashing it. The best thing about the dress is that it has a full circle skirt which is unusual in high street buys which means if I want to really vintage it up, I can pop a petticoat underneath. The dress is made in lovely light cotton and the skirt is lined. the quality is amazing for a dress that cost just £20. Yes £20!!! Such a bargain. I love the cute faux pocket detail and pretty white buttons and as it fastens with a side zip it fits absolutely beautifully. 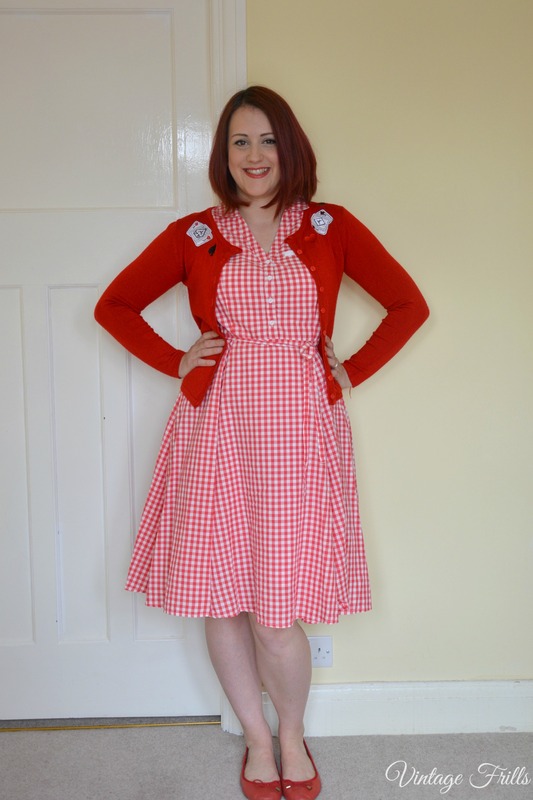 This could be dressed up or down and on this occasion I wore the dress with a red cardigan from Collectif and a pair of red ballet pumps for an everyday look. If I was doing something a bit more special than school runs and housework I’d wear it with a petticoat and some red bakelite jewellery. Worn here with a full petticoat. The other dress I picked up wasn’t the one I was planning to get, I’d had my eye on a white floral shirt dress but I loved the print on this one so much that I just had to have it. This is slightly less vintage looking as the skirt isn’t quite as full and it reminds me of the cut of some of my Cath Kidston dresses. Again this is perfect for wearing as an everyday dress in the summer or dressed up for an event. 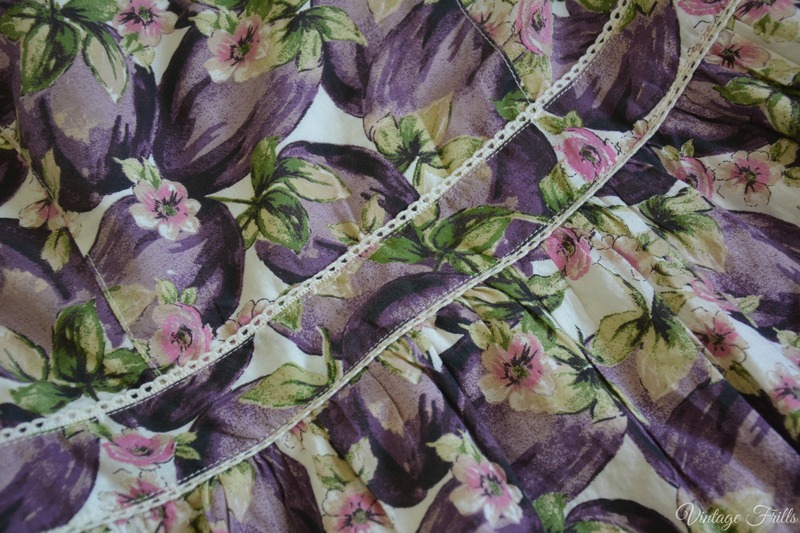 This one was also £20 and is a lovely printed cotton with a lined skirt and pretty covered buttons at the back. I love the pretty trim, which definitely makes the dress look a little more expensive than it was. 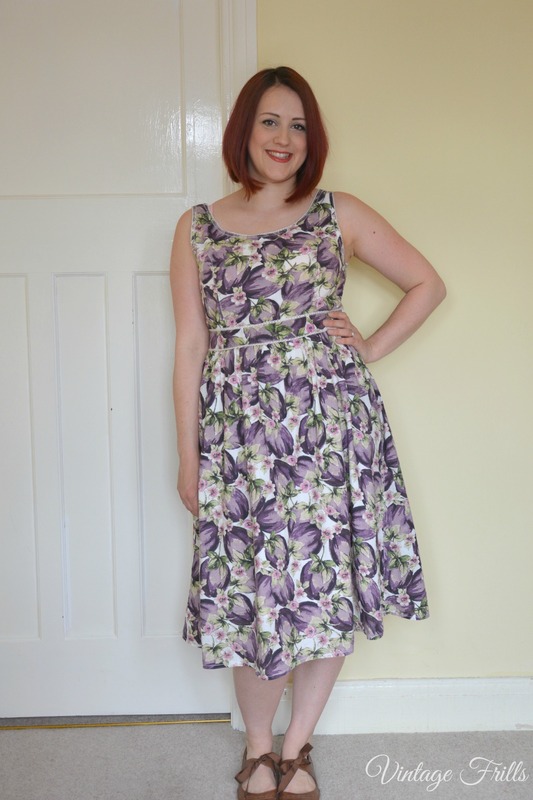 All the vintage style dresses on offer are priced between £18 and £22 so they are really affordable and perfect for someone who wanted to add some modern dresses to their vintage collection or if you want to get something with a vintage retro look on a budget. I took some snaps of some of the other things I liked on my phone, as I really want to go back for more. I know I don’t need any more dresses, but I’m sure I’ll find some excuse to justify the extra purchases! Annoyingly none of the dresses seem to be on the Sainsburys website, so if you want to get your hands on them you’ll have to get them in store. 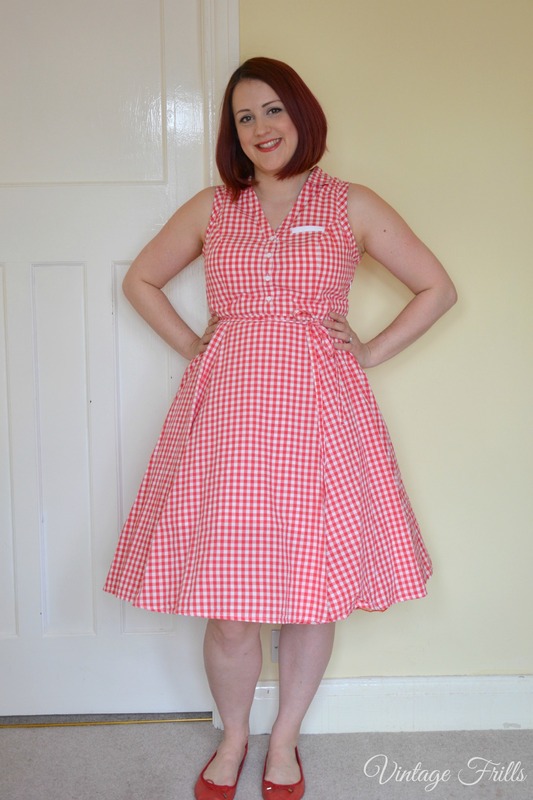 I did take a look on the PR Shots website and found some images of some of the dresses that will be coming in, as well as a gorgeous gingham swimsuit that is totally vintage appropriate. 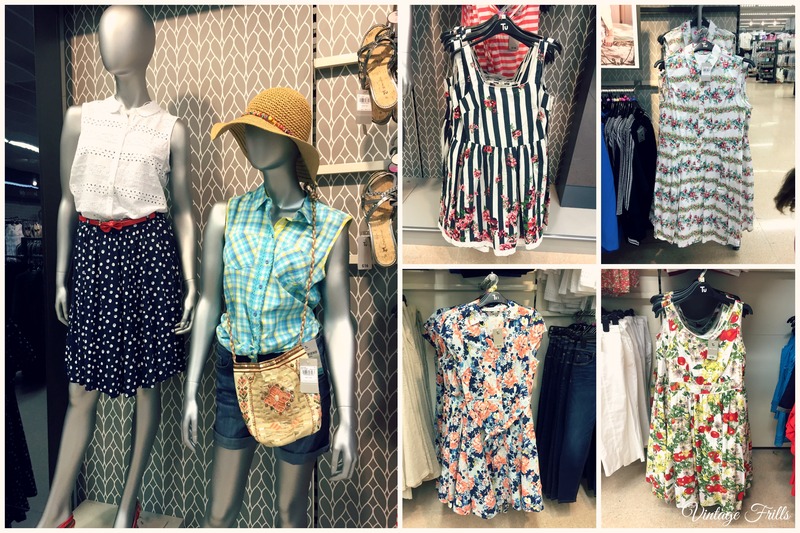 So get on down to Sainsburys and add some pretty dresses to your trollies! They are simply gorgeous! I love the gingham! It is that classic ‘every day’ vintage look which I love! I look at it and immediately think of the show ‘happy days’ or ‘Laverne and Shirly’! They are both really lovely, I’m jealous we don’t have a Sainsburys here in Australia! They also are stocking a fabulous fifties style lemons high waist bikini. It is gorgeous. Such cute dresses to be from the supermarket! Sainsburys must be more like Target here in the US to have a clothing department so stocked with cute things. The gingham dress is classic summer, and I can totally see why the second dress caught your eye as the print is super pretty! It looks like aubergines? Reminds me of a veggie print Dolce and Gabbana collection from a few years back! I’ve got the white dress with horizontal stripes of flowers. It’s very nice, though I find the elastane in the fabric a bit odd – I’m not used to wearing stretchy cotton! I’m so glad you did a post on this! I went into my local Sainsburys recently and theres a whole treasure trove of vintage style/ 1950’s/ Rockabilly style things. Its amazing! I wanted everything. Ps- you look beautiful in these dresses.